Old Chicago was the world's first completely enclosed amusement park and shopping center located at 555 S. Bolingbrook Drive, Bolingbrook Illinois was open 365 days a year. 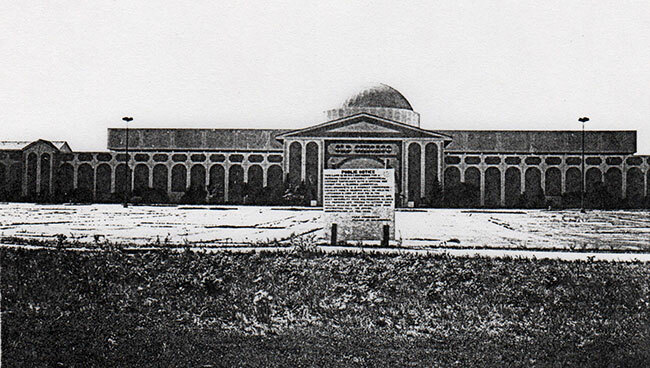 It consisted of a large square building with a dome in the center. 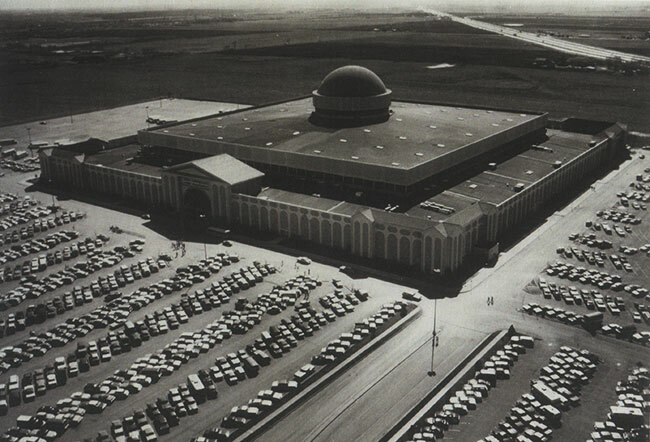 The rides and attractions (the "Old Chicago Fairgrounds") were in the center, under the dome, and the shopping area surrounded them. When it opened in 1975, part of the grand opening celebration included a tap dancer, dancing on the top of the dome. The "Shopping Mall" had a cobblestone floor, and was designed to resemble a turn-of-the-century (20th century) street. Basically it was one long hallway that followed the entire perimeter of the building. At strategic points, there were windows where you could look out into the amusement park area. The shopping mall didn't have any large anchor stores or chain stores, only gift shops, specialty shops and snack bars. Old Chicago seemed like an idea that couldn't fail. In retrospect, however, it's easy to see why it did. The mall consisted solely of small specialty shops and restaurants, and without any large chain stores or anchor stores, it wasn't enough of a shopping mall to attract shoppers. Once the novelty wore off, the building didn't seem to attract repeat visitors, except for those who attended special events or lived relatively nearby. Unlike an outdoor park, which can constantly update and add rides, Old Chicago was confined to the space between its walls, and it got old very quickly. It was also in a somewhat remote location, southwest of the city. The cost of operating the building year-round was probably very high. And I'm sure that when Marriott's (now Six Flags) Great America opened in 1976, it didn't help much either. The Old Chicago Fairgrounds had "31 great rides and attractions" beneath the dome. When it opened, Old Chicago charged $1.00 for admission to the ride area (50 cents for kids), and then charged a flat fee for unlimited rides. A spiral entrance ramp led from the mall level down to the park level, where the rides were arranged in a large circle. Trees, benches and streetlights provided a park-like atmosphere. The "Fairgrounds" had "31 great rides and attractions" all crammed into the domed center of the building. I remember being amazed that they could fit everything in. At the time it opened, Old Chicago charged $1.00 for admission to the ride area (50 cents for kids), and then charged a flat fee for unlimited rides. In addition to standard rides like the Round-up, Tilt-a-Whirl, Chicago Bobs, Scrambler, Spider, Merry-go-round, Monster of the Midway, Rotor, Antique Cars, Barnstormer, Crash of '29 (bumper cars), Enterprise, Trabant, Ferris wheel, Paratroopers, Four Seasons (dark ride), Yo-Yo, Toboggan, Screamer and the Windy City Flyer, there were two Roller Coasters (the Zyclon and the Chicago Loop) and a water ride (the Chicago Log Race). The Fairgrounds also hosted a circus, a vaudeville theater, and a haunted house, as well as a few Kiddie rides and some games of skill and chance. Various events took place at Old Chicago from time to time. Chicago radio stations held 'back-to-school bashes and the Jerry Lewis Muscular Dystrophy Telethon had a donation "fishbowl" there, and did remote broadcasts from there during their Chicago segments. Many rock bands, musicians and other celebrities appeared at Old Chicago. They performed in an area called the “Old Chicago Stage” which was added in 1978. The stage was placed where the Paratrooper ride stood (next to the Haunted House). The Paratrooper ride was sold instead of being moved elsewhere in the park. Here is a partial list of performers: Black Oak Arkansas - (Go Jim Dandy! ), Tommy James and the Shondells, The Coasters (Alley OOP, Charlie Brown), Wild Cherry (Play that Funky Music), Willie Aimes - (Eight is Enough, Charles in Charge), Anson Williams (Potsie from Happy Days), Freddie ‘Boom Boom’ Cannon (Palisades Park), Chubby Checker, Chuck Berry, Peter Tork and the Monkees (He was the only touring member), Jan and Dean (Surf City), Jerry Lee Lewis, Little Richard, Rip Taylor (Toupee and all), Sha-Na-Na, The Ramones (One of the original punk bands), Rex Smith, Gary ‘US’ Bonds, The Shirelles, Blood, Sweat and Tears, The Hudson Brothers (The Razzle Dazzle show), Gloria Gaynor (I will Survive), The Guess Who (American Women), Rick Nelson, The Star Wars Robots (C3PO and R2D2), and Karl Wellenda. Old Chicago didn’t fare well financially. Perhaps, without major chain stores, it wasn't enough to attract shoppers. The amusement park was too confined to attract amusement park aficionados. Old Chicago abrupt closed the amusement park in 1980 and the mall followed in 1981. The building was razed in 1986. This map is from Old Chicago's first year of operation. Consequently, rides that were moved or added later will not be shown here. Old Chicago was conceived by designer/builder Robert Brindle after a visit to Knott's Berry Farm in BuenaVista, California. In June of 1973, Robert Brindle brought a watercolor print of his proposed Old Chicago Towne to the Bolingbrook plan commission. He proposed a 345,000 square foot indoor complex that would include outdoor-type amusement rides including a roller coaster, ferris wheel, and log flume, ringed by specialty shops, boutiques, and restaurants. He promised to "put Bolingbrook on the map." A pre-opening party for Old Chicago on June 17, 1975 for ten to sixteen thousand invited guests created mammoth traffic jams. It took half an hour to travel south on route 53 from Boughton Road to the mall. Two restaurants served Old Chicago: Columbia House owned by Frank Zaucha, owner of the Lemont truck stop and the Old Chicago Biergarten. In July, the Bolingbrook Jaycees stage their third annual fireworks display at Old Chicago, accompanied by parachuters and midget racers. Also in July, billed under the headlines of "Public Executions at Old Chicago" a desperate public relations gimmick promoted the celebration of Bastille Day at the park with fun shows featuring "the rack", cat-o-nine-tails and other antique torture devices. By March, piles of rubble grew along Rt. 53 just south of I-55 as Old Chicago’s walls tumbled and in April, the dome quietly sank into the sunset with absolutely no fanfare. By the end of the month, not a trace of the former amusement park remains - only memories.